Please take note that Glenwood Chess Club will be resuming this week Friday (24th July 2015) at Glenwood Preparatory School. 1) Those that have played in the last tournament (Club Championship) will automatically be entered into the tournament. If you are unable to make the tournament, please notify me. Members that have played the 1st Swiss only are to notify me if I must include you for the Round 1 pairings. 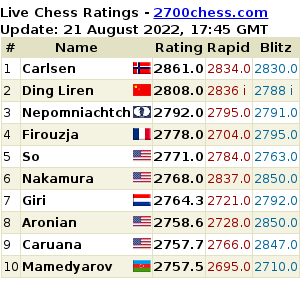 2) All players with CHESSA rating (latest ratings database to be used) of 1300 and above will play in the A section. All players 1299 and below will be placed into the B section. However, if you wish to be placed in the A section, please notify me before Friday. 3) Members still owing fees will not be placed into the pairings for Round 1 and so on until outstanding fees are settled. 4) All players to be present at club by 18h00 with the round to start at 18h30. Late entries will be placed into the tournament from Round 2. Time controls for the Round are 90/90 min for both sections. 5) Notation is compulsory. Clocks will be rented out at R2 per game. Players playing as black for the round are responsible to hire the clock or if you have your own, make it available for the game. 1) Please provide me with your name, surname, date of birth and gender by Friday or at 18h00 at Glenwood Chess Club. I hope to see many old faces and some new faces joining our club.